Mr. William Ronald “Ronnie” Dryden, Age 76, of May’s Lick, Kentucky passed away Sunday, August 12, 2018 in the University of Kentucky Chandler Medical Center in Lexington. He was born on May 28, 1942 in Mason County, Kentucky, a son of the late William Stanley Dryden and Ruby Fowler Dryden. Mr. Dryden was a retired inspector for the Kentucky Department of Agriculture and he was a veteran having served in the United States Army Reserves. 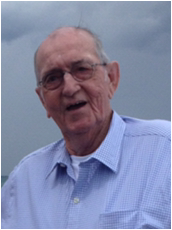 He was a member of the Forman’s Chapel Methodist Church and attended the Ewing Baptist Church. Mr. Dryden had owned Dryden’s Grocery and was a farmer. He enjoyed watching television, especially Gunsmoke. Survivors include his wife, Edith Fannin Dryden, whom he married on December 18, 1965, one son, Billy Dryden (Mary Huff) of Flemingsburg, one daughter, Ronna Earlywine (Randy) of Ewing, one sister, Brenda Craig (David) of Salvisa, Kentucky, four grandchildren, William Eric Earlywine, Andrew Earlywine, Kelsey Dryden and Benjamin Dryden, two great-grandchildren, Willow Earlywine and Kynlee Earlywine and several nieces, nephews, other relatives and friends. Funeral services will be conducted at 1:00 P.M. Thursday, August 16, 2018 at the May’s Lick Baptist Church with Billy Glen Cowan officiating. Burial will follow in the May’s Lick Cemetery. Full military rites will be conducted at the gravesite by the W. N. Fant American Legion Post No. 5 and the Franklin Sousley VFW Post No. 1834. Visitation at the May’s Lick Baptist Church is from 5:00 P.M. to 9:00 P.M. Wednesday. Pallbearers will be William “Eric” Earlywine, Andrew Earlywine, Kelsey Dryden, Benjamin Dryden, Angela Logdon, Brian Craig, Randy Earlywine and Ray Walters. Contributions are suggested to the Ewing Baptist Church.